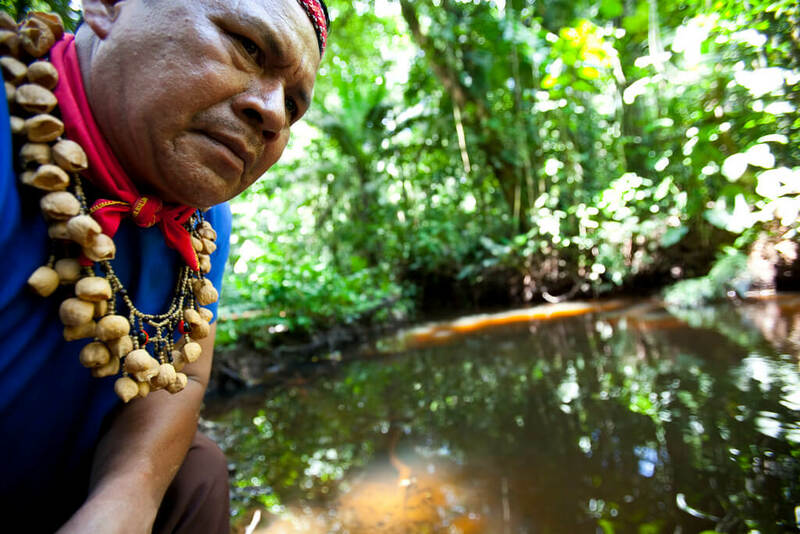 Cofan Indigenous leader Emergildo Criollo looks over an oil contaminated river hear his home in northern Ecuador. Photo by Caroline Bennett / Rainforest Action Network (flickr). Some rights reserved. Este artículo está disponible en español aquí Indigenous battles to defend nature have taken to the streets, leading to powerful mobilizations like the gathering at Standing Rock. They have also taken to the courts, through the development of innovative legal ways of protecting nature. In Ecuador, Bolivia and New Zealand, indigenous activism has helped spur the creation of a novel legal phenomenon—the idea that nature itself can have rights. The Kichwa notion of “Sumak Kawsay” or “buen vivir” in Spanish translates roughly to good living in English. It expresses the idea of harmonious, balanced living among people and nature. The idea centers on living “well” rather than “better” and thus rejects the capitalist logic of increasing accumulation and material improvement. In that sense, this model provides an alternative to the model of development, by instead prioritizing living sustainably with Pachamama, the Andean goddess of mother earth. Nature is conceived as part of the social fabric of life, rather than a resource to be exploited or as a tool of production. Property rights are a primary example of commodifying the natural world. When treated as property, nature incurs damages that often go unrecognized. Stone writes that an argument for “personifying” nature can best be considered from a welfare economics perspective. Under capitalist economic logic, many externalities that negatively impact the environment are not registered when calculating the cost of an action. Transforming nature legally from mere property to a rights-holding entity would force byproduct environmental effects of production to factor into cost calculations. Under this framework, nature would be better protected. Moreover, under Ecuadorian law, the rights of nature are subject to principles of so-called national development. Article 408 of the constitution stipulates that all natural resources are the property of the state, and that the state can decide to exploit them if deemed to be of national importance, as long as it “consults” the affected communities. However, there is no state obligation to abide to the result of the consultation to these communities– a gaping hole in full protection of these environments and the people living within them. Bolivia’s government soon instituted the Law of Mother Earth in 2010, later re-coining it as the Framework Law of Mother Earth and Integral Development to Live Well. The law lays out a number of rights for nature, such as the right to life and to exist, to pure water, clean air, to be free from toxic and radioactive pollution, a ban on genetic modification, and freedom from interference by mega-infrastructure and development projects that disturb the balance of ecosystems and local communities. Their centuries-long struggle finally yielded results. As part of New Zealand’s reparation process towards Indigenous Peoples, the national government negotiated with the Tuhoe tribe regarding their historic land. In 2012 the Tuhoe tribe accepted the Crown’s offer of financial reparations, a historical account and apology and co-governance of Te Urewera lands. The national government renounced ownership of the land, giving the land its own personhood. The Maori fought to protect the river through a series of court cases beginning in 1938, defending their claim to the management of the river as its rightful guardian. Throughout the court cases, negotiations were undergirded by the native saying “Ko au te awa, ko te awa ko au,” which translates to “I am the river and the river is me.” This reflects native philsophies of reciprocal and equal relations between people and nature. The legal concept of rights of nature signal the influence of Indigenous Peoples as political actors in state-making, fundamentally reimagining law and how the natural world is conceived. These ideas present a revolutionary rupture in the conventional anthropocentric understanding of sovereignty, and a realignment of how the natural world is valued. In fact, they could chart the path forward for a new understanding of mankind’s relation to the natural world, even if they operate within the legal structures that are not conducive to indigenous philosophies. It is true that the rights of nature as they currently stand have deep limitations, particularly given the ongoing extraction of non-renewable natural resources in Ecuador and Bolivia. Problems of corruption, environmental inequality and economic dependence on extractive industries are major challenges to the full realization of the rights of nature.